Montana is a watcher of whales, saver of turtles, wayfarer and shepherd. She is a writer, photographer, art farmist and was formerly a magazine art director, media coordinator, journalist and past winner of the Sutton Agricultural Fair Spelling Bee. 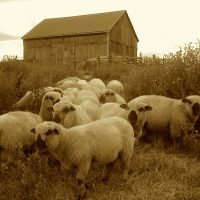 She tends an oversized garden, eats real food and raises Shropshire sheep and other heritage livestock on Wholearth Farmstudio in Northumberland County, Ontario Canada. She received a CBC Literary Award, Ontario Arts Council Writer’s Reserve Grant, and has appeared in EnRoute, Mind’s Eye, The Globe and Mail, The Toronto Star, Canadian Women Studies Literary Journal, Watershed Magazine and Edible Toronto. 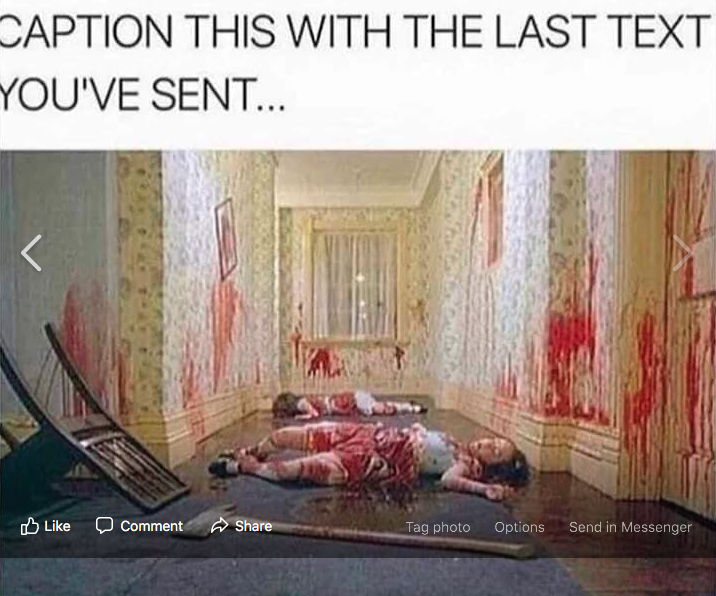 Speaking of joy, there is a meme making the rounds showing an aproned woman freshly axe-murdered, with her bloody dead daughter on the floor beyond. It’s a horrific scene from “The Shining” and reads, “Caption this with the last text you sent”. Am I the only person who doesn’t find it funny? It’s disturbing and offensive. I’m trying to understand the seeming need to spread violent thoughts and images, especially at a time when sharing kindness and encouragement is what’s needed to lift spirits, rather than dissolve them. Why choose to consume more trauma? Love is what matters and all that (it is). We all have to deal with our individual share of surprise pain and suffering in this lifetime, what makes people seek out more? We all understand that yoga and mindful meditation ensure a more peaceful existence and that too much stress IS the worst thing for us. Joy is where it’s at. So how did a growing audience for post-apocalyptic and extreme violence entertainment come to be? Do people share murder scenes and other upsetting imagery to have cortisol rushes? I don’t get it. I’d scrub this image from the web if I could, to help clean up the garbage. People often click ‘Like” or “Share” without even reading the link, I know. But if I were one of the Facebook Cleaners, that button would have been “Delete”. Fellow humans, warm hearts, help me out here. Am I being oversensitive about a meme? I’m wondering if anybody else had an instant physical and emotional reaction to seeing it as anything but light humour? What is the draw to it? Is there a genre name for it, and can we all please now move toward that genre’s extinction? Neither can I rouse any curiosity to finish the trailer for the uninspired “Bird Box” horror on Netflix, or watch any of their flood of offensive offerings. Had to turn it quickly off after 11 seconds. The instinct to prevent externally imposed violent thoughts from inhabiting my brain is as great as the one that directs me to eat leafy greens and drink more water. I am going to go draw sunny winged fairies now, the ones that live in those pink clouds. Unicorns and mermaids welcome. It started with this man. Well, “I” started with this man, Philip G. Jones—or with the help of my mom, he started me. My father was named after my grandmother…Phyllis Muriel Porteous Jones. I can rarely mention her without boasting that she was one of the first few women members when Mensa began in London, England. Sounds cool though doesn’t it? The fact of her ethereal ancestral intelligence helps soothe me when I’m feeling challenged by life’s questions. We all want to think we are smart, beautiful, clever, funny….When we’re not so sure, it helps to have notable relatives to defer to, in a vague hope that the theory of a wandering random gene is reasonable grounds to assume some smarts by association. I’m holding that thought. My dad Phil Jones (the II) was proof enough of such logic. All Phyllis’s sons inherited her creative intellect and joie de vivre. My father was a witty, funny, charming, gregarious creative thinker who endeared himself to most every person that ever met him. He died this past August, just before his 80th birthday. My son Phil Jones (the III) carries on that notion as living proof. He was a gifted kid who has grown into a talented, creative, ebullient, challenging, imperfect, spectacular young man, known to his friends as Fox. My dad would burst when he spoke of his only grandson…he was particularly impressed by his namesakes gift of language and technology. He’d raise a glass to him today if he could, no doubt with a sage and wise few words on the side. I can say all this because I am his mother, and he turned 30 years of age today. I don’t have to be as careful of embarrassing him as when he was boy. As I grow older too, I’m entitled to (or perhaps just expect) somewhat more tolerance. It’s one of the benefits. On March 8, 1982 at 3:22pm, after 16 hours of labour, I delivered a 9 pound, 2 ounce baby boy into the world in Kingston, Ontario. He had a lush, thick mane of auburn hair, smiling cheeks and sparkling eyes, and he changed my life. So really…it’s my Birth Day. I took over a week to name him…my lips testing various designations that were unsuited to a lifetime of calling, let alone hearing. Nothing fit. The moment I did suddenly know was perfect and clear and obvious…it was there all along. My parents had come to visit and meet their only grandchild. As I lay rapt in his newness I heard my mother open the farmhouse kitchen door, and call out to my Dad who was pitching hay to my lovely fat heifers. When I heard her British accented “Oh Phiiillliiip…” sail out across the barnyard, it sounded so solid and reverent and long lived, I looked down and knew the third wee Phil Jones was in my arms. His hair was the sound of autumn leaves…so his middle name became Russell…though I didn’t muster the whimsy then to spell out the actual R-u-s-t-l-e. As it happened, the handle meant “red-haired and fox-like”. Little did I know that as a teen on his westward backpacking adventure, he’d by escorted by various foxes in his travels. There were so many sightings when he was amongst the group, that his friends took to calling him Fox. I love him with all my heart. And to love is to promise. Whether a friend, a partner, a parent or a child…the best relationships are actually a shift toward realized individual potential. Initial meetings with a new person simply offer a peek into what could be—we flash a picture of the best of who we are, and then as we move toward love, we commit to fulfilling that glimpsed potential. A mother and newborn are making that same promise: I am the elder, I will teach you the wonder of being a person. I gauge—as parents do—my aspirations, my beliefs and my actions, against his experiences, still checking in with the reflection every so often to see if I am being the life example I had hoped to be as a new young mother. Still. It doesn’t go away with time. I have fallen short in many areas, and exceeded my aim in others. If nothing else…my son will know by now that his mother is quite human. For three decades he has been the focus of my life purpose…interwoven with every interest I ever held and every direction I ever took, he is my measure. I will continue to love him with all my heart for the next three decades too…I’ll be strong, struggle, blossom, be joyous, fall down and get up, and so will he. I’ll be his wings forever, and sprout Grandwings when it’s time.